As a CME director, you know that the success of your program is tied to the quality of the data that you use to make day-to-day decisions. However, which data will have the most impact on the success of your long-term growth strategy over time? In this post, we’ll explore the types of data that are critical to your decision-making process as your program scales, and show you the easiest way to get your hands on your most important data quickly. If you are using an LMS, then it is likely that you have some course data readily available to you. The value of that data depends on its depth and your ability to quickly translate the numbers into insights that can be used to create CME management solutions on the fly. That will require simultaneous real-time and historical course and global program data collection, with summaries of relationships between data sets (such as learner assessment performance, curriculum updates, and post-course learner knowledge retention) and analysis. That’s a two-step process that can be challenging at best if you’re attempting to handle it manually. At worst, “dirty” or incomplete or flawed data can corrupt your findings and cause you to build a strategy based on an insight that is fundamentally inaccurate. Most importantly, false insights lead to misdirected academic policies, preventing you from giving your learners the educational experience that they need, based on a data-driven assessment of their needs. Are your learners expressing satisfaction with the academic depth of your course content? Do most of your learners feel that the range of courses offered meets current demands for new CME topics? Are support ticket requests for low-complexity issues occurring frequently? Are you seeing an influx of new learners from several demographic groups? Use your marketing campaign to emphasize your LMS’ high-quality user experience, effective presentation of timely topics, and ability to meet the educational needs of a diverse audience of learners. Are high-performing and struggling learners finding the same activity content challenging? Are experienced medical professionals leaving your course as they near its end? Are high-performing individual learners with a few characteristics in common—such as professional experience—struggling with an addition to your curriculum? Examine connections between your course content usability and learner performance. If issues are wide-spread and spanning different learner ability groups, you might consider inviting several students to help test a new curriculum component to determine if the structure of the content is impacting learner outcomes. Are user support requests increasing, and focused on low-complexity issues? Do learners report that navigating their activities took more time than they anticipated? Are strong performers dropping out of courses and remaining unresponsive to email reminders? Use support request information to pinpoint platform design issues that may be impacting learner motivation. If you are not using an LMS which was built specifically for CME learners, you may have to consult with a website usability expert to determine the roadblocks that your learners are encountering in completing their activities. Learn how EthosCE uses learning experience design to make a user-friendly LMS. Are your students more or less engaged with their course and the material over the past year? Can you identify patterns in learner outcomes as they relate to changes in the content of select activities? Can you describe the impact over time of updates to your curriculum on learner outcomes since you began using your LMS? The accuracy of your learner outcomes data is essential to your ability to optimize your resources to achieve your strategic goals. Use an LMS that doesn’t require a helping hand to collect, warehouse, and translate your course and program data into insights that you can use to build strategy. You need access to the right data to create winning long-term marketing strategy. Manual data collection is time-consuming and frequently results in “dirty” data due to human error. CME directors may find themselves overwhelmed with the amount of data that their programs generate, but learning which data matters are essential for CME management decision-making. Access to real-time and historical learner performance and learner behavior (learner engagement with the course, responsiveness to email reminders, course completion rates) is critical to strategy building. Context is essential when analyzing data over time. Real-time data isolated from its historical context can provide limited insights, but it can’t help you build a long-term strategy. As a CME director, you need a simple way to review new data and compare it with other data sets to identify meaningful patterns that occur as a result of specific decisions (such as a curriculum change and learner performance over time). 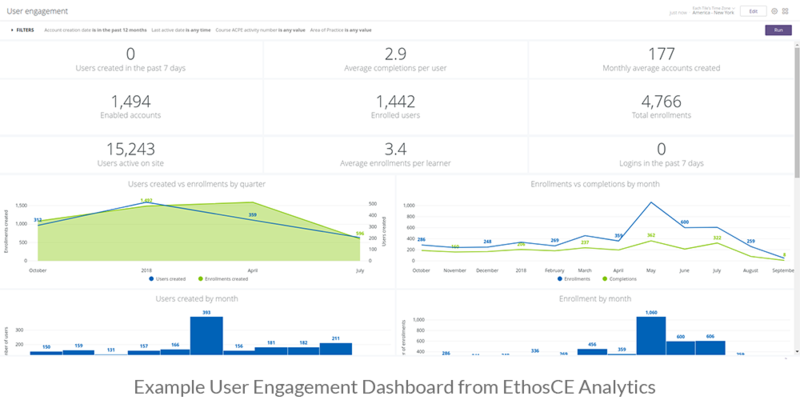 EthosCE Analytics (a full-featured data analytics suite included with the EthosCE CME LMS) allows for advanced data exploration that produces aggregate and granular insights that you can use to build a powerful CME management strategy. Advanced data exploration also involves data set definition evaluation (why each data set is significant and how it differs from other points of reference) which allows you to delve into predictive analytics. As you look at patterns in past data, it is easier for you to predict learner outcomes and to evaluate your past successes accurately. 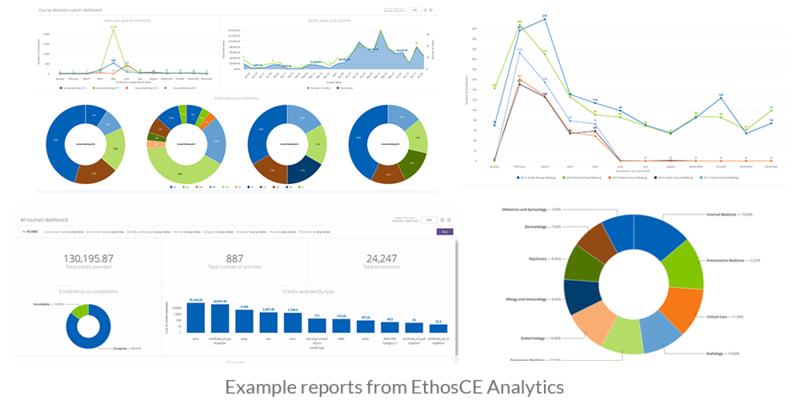 EthosCE Analytics allows advanced insights to be shared easily with data visualizations that provide an overall view of critical data at a glance. The EthosCE platform automates data collection and segments relevant information so that you have 360-degree data visibility at every level of your program. The 30-second summary? You only need one platform to launch, manage, and grow your CME program. 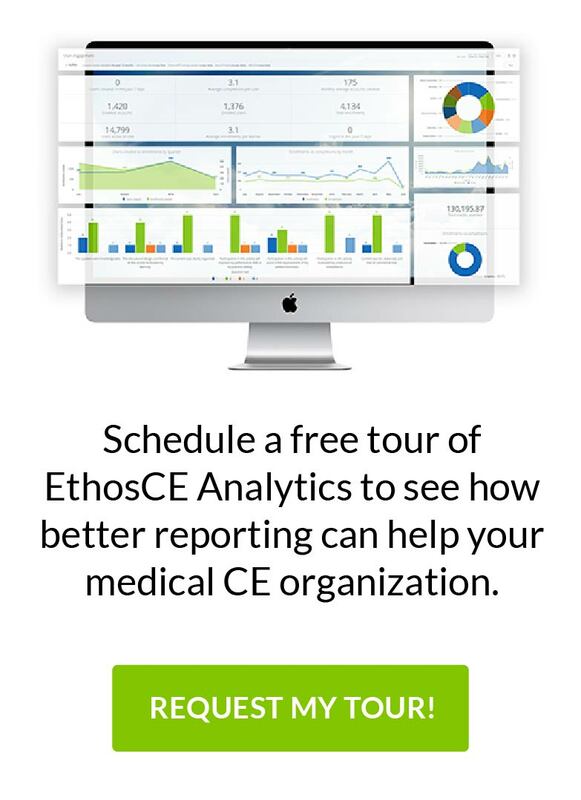 At EthosCE, we’ve spent more than 16 years perfecting a purpose-built CME LMS platform that is designed to streamline the CME management process and make it easier for CE directors to achieve their goals. Helping many associations and universities make the switch to our easy-to-use LMS. If you’d like to learn more about how EthosCE may be the right LMS for you, feel free to request a 1-on-1 demo walkthrough today.